Can I Put My Guinea Pig's Playmate in With Her & Her Babies? Breeders and pet specialists suggest guinea pig enthusiasts always consider adopting two guinea pigs, as they are creatures who enjoy company and can grow lonely without a playmate. But what happens when you find out one of your guinea pigs is pregnant, and not only will she have the playmate you adopted for her, but also a few more friends once she gives birth? Some guinea pigs enjoy sharing space with others, but in some cases you will need to separate a mother pig and her piglets from the playmate once she has given birth. A guinea pig can become pregnant just hours after giving birth, and so if her playmate is a male, it is best to separate the mother pig and her young from her playmate as soon as possible. Some care guides even recommend separating the male guinea pig from the female before she gives birth if you know the time is soon. If the male pig exhibits aggressive behavior at any time, however, he should be separated from the mother immediately, especially if she has already given birth. If the two guinea pigs are female, you will obviously not need to worry about the mother pig becoming pregnant again. If any of the piglets are male, however, it will be necessary to separate them from both female guinea pigs as soon as they reach the breeding age of 3 weeks. Even if the pigs are all female, aggressive behavior on the part of any of the animals could still become a problem. Guinea pigs, like all animals, need their space, and should they feel their space is encroached upon, can become territorial. If you choose not to separate a mother guinea pig, her young and her playmate, it is important then that the cage or pen that they all share is large enough and provides enough hiding spaces for each guinea pig. The Humane Society of the United States recommends at least a 30-by-50-inch cage for two guinea pigs to share, so once the piglets have been born you will need to gauge necessary cage size based on how many guinea pigs will be sharing space. The Humane Society recommends at least 30-by-62 inches for three guinea pigs and 30-by-76 inches for four. Whether you choose to keep your guinea pigs all together or need to separate a mother and her babies from her playmate, there are benefits to keeping guinea pigs together. As herd animals, they enjoy not only the company of their human owner, but also each other. Once the baby guinea pigs are done nursing, it could be beneficial to keep all of the guinea pigs together again in one roomy cage, if breeding concerns are not an issue. For owners who may have adopted two female guinea pigs but now have male guinea pigs after the mother gave birth, experienced veterinarians can neuter male guinea pigs to ensure that breeding won't be a problem. Teacup Piglets: How Big Do They Get? How Can I Stop My Bettas From Fighting? What Are the Benefits of Castrating Cattle & Hogs? Can Two Female Lovebirds Bond? 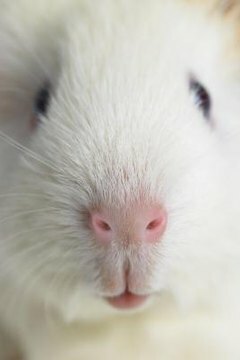 Should a Guinea Pig Be Kept With Another Guinea Pig?